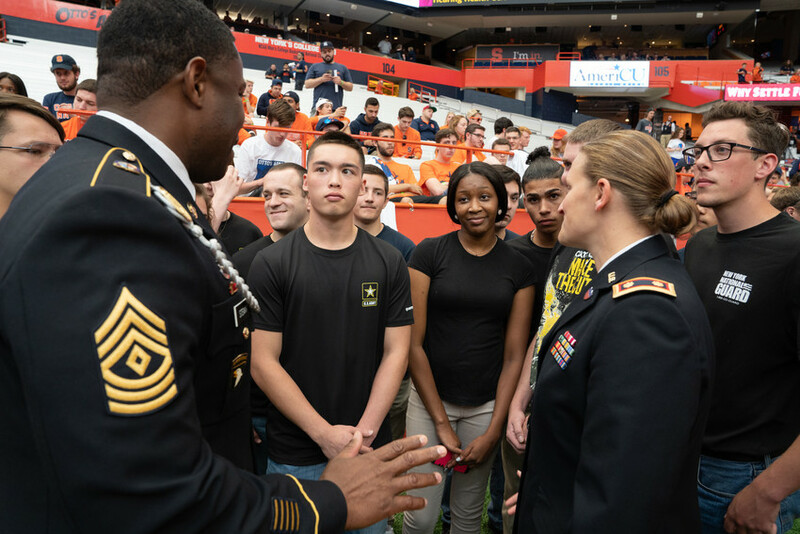 Over the weekend nearly 3,000 military service members, veterans and their families from the Syracuse area and Fort Drum were honored at the Syracuse vs. University of Connecticut football game for their service during the annual Military Appreciation Game. The national anthem was sung by Syracuse University Army ROTC Cadet Holly Gerber-George while the Airmen and their families from the 174th Attack Wing held a large U.S. flag on the field. Coin toss by honorary captains Colonel Michael Smith, Commander of the 174th Attack Wing, and Chief Master Sergeant Michael Will, Senior Enlisted Advisor for the 174th Attack Wing in Syracuse. Veterans at the tailgate attended the game free of charge following the annual ‘Cuse for Troops ticket promotion which allows the public to thank veterans and active duty service members for their service by sponsoring their attendance to the game. The objective is supported by a series of strategic initiatives, including the creation of the Office of Veteran and Military Affairs, IVMF, expanded capabilities of the Office of Veteran Success and construction of the National Veterans Resource Center, a first-of-its-kind multi-use facility dedicated to advancing academic research, programming and community-connected innovation serving the social, economic and wellness concerns of the nation’s veterans and families. The Syracuse football team defeated Connecticut 51-21.